Kevin Durant is expected to sign a contract extension with the Golden State Warriors this summer, after winning two titles and two Finals MVP awards with the team. While it might sound like a generous offer, the comment actually highlights an odd reality about the league: Because of the salary structure of the NBA, its superstars are in many cases wildly underpaid for the value they bring to a franchise. 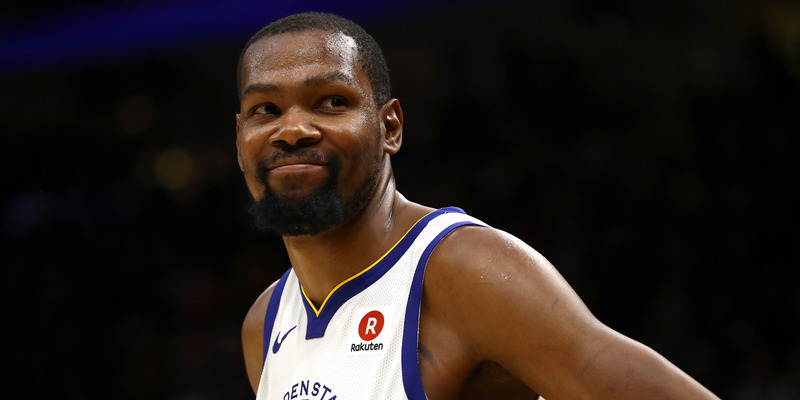 Things have gone about as well as Kevin Durant could have imagined since his dramatic decision to join the Golden State Warriors during the 2016 offseason. In two seasons with the Warriors, Durant has won two NBA titles and two Finals MVP awards, becoming the final superstar piece that cemented Golden State as a dynasty. While Myers’ comments may seem generous, they actually highlight an odd reality in the NBA: Because of the salary structure of max contracts, the best players in the league aren’t paid their true worth. The most lucrative deal that Durant could make at this time is to opt out of his current contract and then sign for four years and $US160 million. While that may be a fortune to sports fans, it’s also far below the true value that Durant brings to the Warriors, especially considering the team is willing to give it to him without any negotiations. As Tim Kawakami at The Athletic noted, this iteration of the Warriors is the greatest cash machine the league has ever seen. Between long runs through the playoffs that bring in extra home-game revenue and the high ticket prices for a team that calls Silicon Valley home, Golden State has seen its value soar in the past few years, thanks in no small part to Durant’s effort. On an open market, it would be easy to imagine Durant being paid far more than $US40 million a year. Last summer, LeBron James made a similar point when Durant’s teammate Stephen Curry signed his $US201 million contract. While it was the largest contract in NBA history, the Warriors had seen their franchise value grow to $US2.6 billion in 2017 from $US450 million in 2010, largely thanks to Curry’s play and role as the face of the team. For now, NBA superstars are likely to remain underpaid. Should the league someday adopt a system closer to Major League Baseball, stars could be able to make their worth – but until then, the Warriors will be able to keep growing the value of their franchise at an astronomical pace while the earnings of the players adding that value are capped. It’s no wonder negotiations are so easy.